During breeding season, females lay one egg every two days, and eggs hatch in the order in which they were laid. The boreal owl is named for its northern habitat, the boreal forest. In Europe the same owl is called Tengmalm's owl. It is one of three small owls in Alaska, about eight to nine inches long (20–23 cm) with a wing spread of 21 to 24 inches (53–61 cm). The other small owls are the saw-whet owl which lives in Southcentral coastal and southeastern areas and the pygmy owl which only lives in Southeast Alaska. Female boreal owls average 6.4 ounces (179 g) and are larger than males at 3.8 ounces (106 g). It has a dull white facial disk with almost black upper corners and raised white eyebrows, giving it a surprised look. The top of the head has numerous small white spots. The bill is light-colored. Like most owls, the boreal owl does not construct a nest. The female lays her eggs in old woodpecker nest cavities in trees. The owl nests in closed-canopy forests that are at least partially composed of deciduous trees. The owls are territorial, but males will mate with more than one female and nests can be as close as 300 yards (274 m) apart. The owl readily uses man-made nest boxes. These boxes have been used in Fairbanks and Anchorage. The female lays from three to seven eggs starting in April or May, varying with food abundance. Only the female incubates the eggs. The male brings food to the female and often perches nearby. The young hatch 25 to 32 days later in the order the eggs were laid. If food is abundant all chicks will survive. If, however, food is scarce then only the first born (larger) chicks will survive. The young fledge from the nest 28 to 36 days later and become independent after five or six weeks. In central Europe the age of first breeding was one year. The boreal owl has a highly developed facial disk and asymmetrical skull which aids in directing sounds made by its prey to the owls' large ears. The owl hunts at night mainly for voles, mice, shrews, and small birds. During the summer it may eat insects. When vole populations decrease, the owl will increase the percentage of shrews it eats. They will take mammals up to squirrel-size and birds up to thrush-size, but voles are their principal prey. The owls mainly hunt in the early morning and late evening hours from a perch in the forest. They drop on their prey using their talons to hold the vole and then bite the head or neck to kill it. They eat the prey in small pieces, usually discarding the intestines. Afterwards they regurgitate a small pellet containing undigested bones and hair. 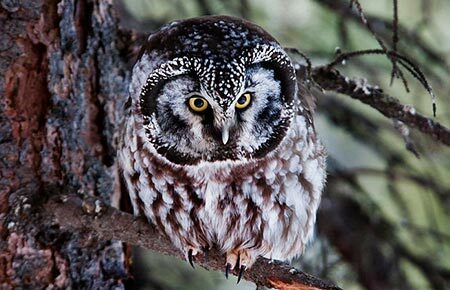 The boreal owl is rarely seen because it is mainly nocturnal and solitary. During the day, birds roost close to the trunk in dense vegetation near the crown of the tree. People can sometimes find these owls when they are calling during the breeding season. 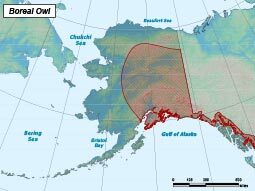 In Alaska the owls start advertising calls in late January or early February and continue until late April. Their call is a rapid, soft, regularly repeated "po-po-po-po," and can be heard up to one and a half miles away. When calling they can sometimes be tracked down and seen but often they will fly a short distance and start calling again. In the spring people often mistake the call for the snipe winnowing call. The boreal owl (Aegolius funereus) is a common but rarely seen bird of the boreal forest in Alaska. It occurs throughout the forested areas of the Interior, upper Kobuk valley, Kodiak Island, and western Southcentral, including Prince William Sound out to the Alaska Peninsula as far as King Salmon. It is also occasionally found in Southeast Alaska. The species has a circumpolar distribution from eastern Canada to Alaska and from western Europe to Siberia. In North America it nests as far south as Colorado. The owl is a local resident and does not migrate although there may be food induced movements. Females may leave Alaska during the winter, but not much is known about their movements. Agriculture and logging are impacts on the owl, although mitigation might be possible. The owls are fairly tolerant of disturbance and have been found existing within housing developments, provided the natural character of the boreal forest is retained. Forested areas of the Interior, upper Kobuk Valley, Kodiak Island, and western Southcentral. Voles, mice, shrews, and small birds. Occasionally insects. Female lays from 3 to 7 eggs starting in April or May. The young hatch 25 to 32 days later.